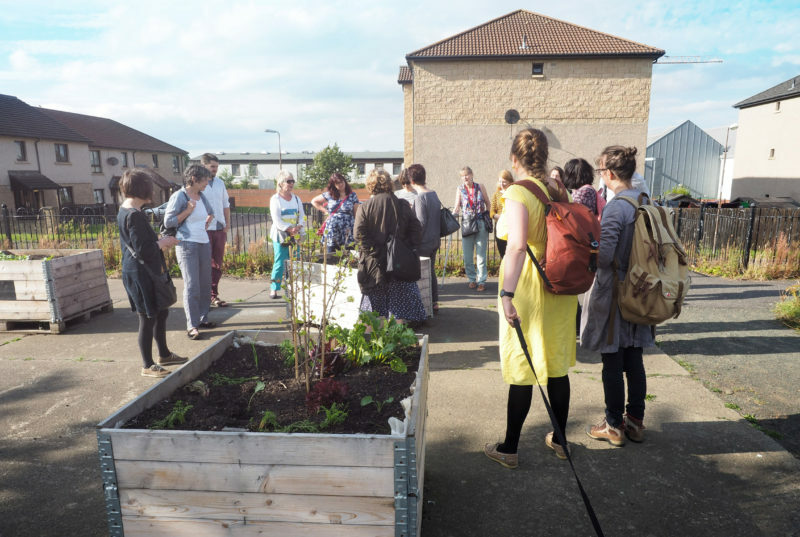 In August the Green Tease network met at North Edinburgh Arts for a guided tour of three inspiring urban brownfield site developments, led by Centipede Projects’ artist-in-residence, Natalie Taylor, and Kate Wimpress, Director of North Edinburgh Arts (NEA). The event was aimed at those working in areas including planning, community development and landscape architecture and focused on creative approaches to working with members of the local community and diverse stakeholders to enhance a number of previously neglected public sites in the Muirhouse area. Sharing the stories behind numerous site developments, including the NEA garden, the Bark Park, Labyrinth and a 100 seater rammed earth Amphitheatre, Nat and Kate talked us through some of the key lessons learned in the process of growing the social and environmental sustainability of the neighbourhood. Both Nat and Kate spoke of the benefits of developing the award winning garden at NEA, since 2013. As well as breaking down barriers to access and use of the centre, the garden has become an important testing ground for the development sites to follow outwith the grounds of NEA. 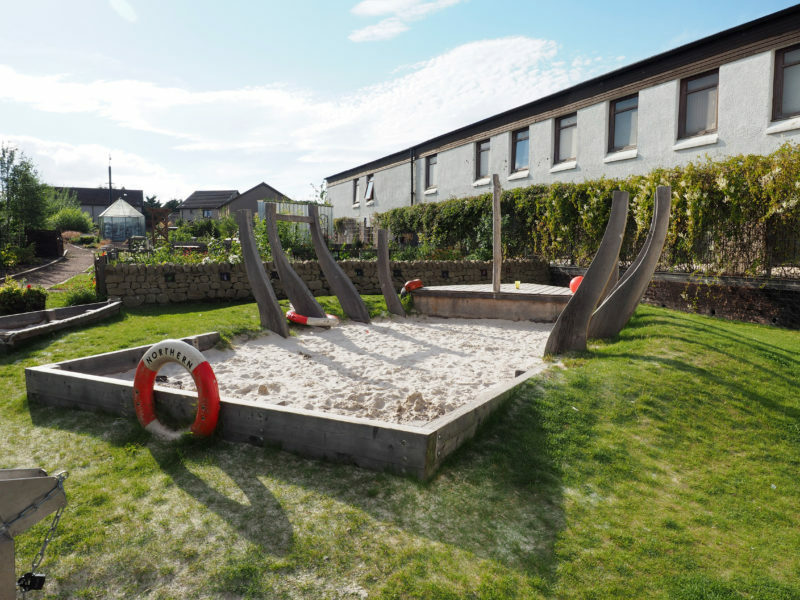 An integral aspect of Nat’s practice is to develop sites in response to the needs and interests of local children and families. Her understanding of these needs has grown out of an extended conversation with neighbourhood residents, held during door-to-door visits, through many shared meals and events, and talking to young people and adults who regularly use the Muirhouse Meadow. 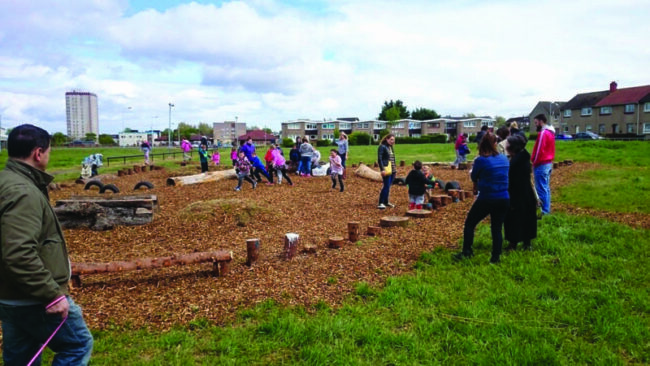 A resounding interest of the community was the creation of welcoming, clean, play spaces where both young people and adults alike could enjoy time outdoors. Working with a variety of natural and re-purposed materials, Nat took inspiration from projects such as the Berlin Playgrounds and Assemble’s Baltic Street Adventure Playground, to deliver low-cost, creative solutions to local design problems. The taking of risks collectively with the community is something which Nat and NEA see as crucial to the success of each site’s development. In the creation of the amphitheatre, for example, both Nat and volunteers undertook the learning of new skills required for the building of the structure. 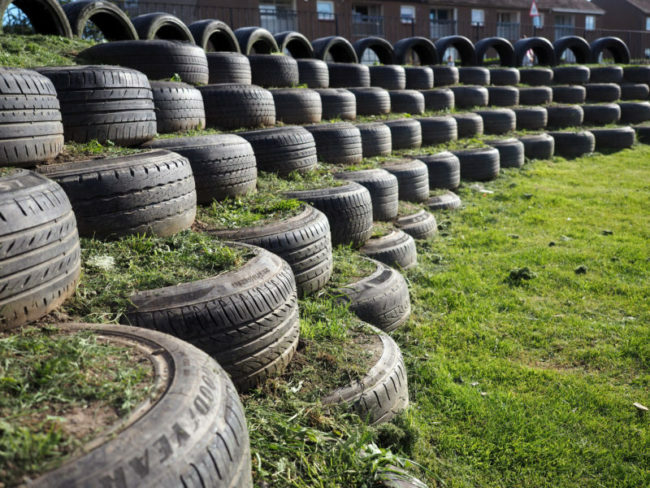 Using materials such as car tires and wood also posed a potential risk given the possibility for antisocial behaviour in the area. This was addressed on the basis that by creating something beautiful and responsive to local needs, people generally want to look after it, learned through previous projects such as the NEA garden. Also much work was done in involving the young people and children directly in the making process. 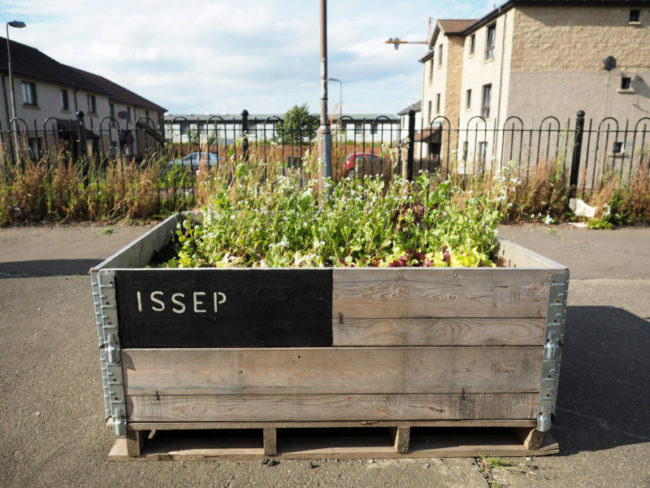 As well as play areas, NEA and Centipede Projects have introduced a number of growing sites, including raised beds and planters, within the garden and on the Muirhouse Meadow, with the long term aim of developing school and community food education and growing initiatives. The introduction of these new components again has been underpinned by NEA’s longstanding commitment to improving the visual appearance and perceptions of Muirhouse, as well as the underlying social and environmental sustainability of the area. Special thanks again to Nat, Centipede Projects and North Edinburgh Arts for sharing their inspiring work with the Green Tease network! This event is run as part of our Green Tease Open Call fund. Interested in running your own Green Tease event? Find out more and apply here. Green Tease is an ongoing informal events programme which aims to build connections between creative practices and environmental sustainability, through the exchange of ideas, knowledge and practices. The majority of our Green Tease are free to attend with refreshments provided. Find out more here.